Writers and journalists are facing unprecedented levels of hate and harassment online. 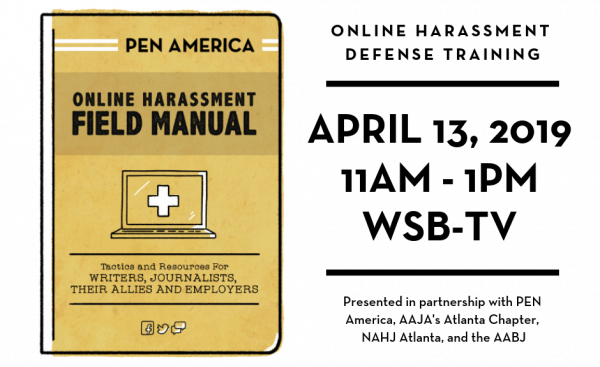 Building on PEN America’s Online Harassment Field Manual, this training session, presented in partnership with AAJA’s Atlanta Chapter, NAHJ Atlanta, and the AABJ, equips writers and journalists, as well as their allies and employers, with practical tools and strategies to defend against online abuse, including: preparation, response, legal considerations, self-care, and best practices for offering support. While there are no easy answers, open conversations about the impact of online harassment and how to fight back can empower writers and journalists to stay online and continue exercising their free expression rights. This session is free for members of PEN America, AAJA’s Atlanta Chapter, NAHJ Atlanta, and the AABJ, but advanced registration is required.